Whither Goes the Bridgewater Collection? This isn’t exactly breaking news, but since I’ve been away and all, I haven’t had the time to process this. It’s a rather major development in the British Museum world that could end up either to the great benefit or even greater detriment to the museum-going public. Basically, the Duke of Sutherland, who owns what is perhaps the most important collection of old masters still in private hands, has decided to sell some of the works in his collection. But before offering them on the open market, he has given the National Gallery of Scotland, where these works have been deposited and on display since 1945, the chance to acquire them at a favourable price. 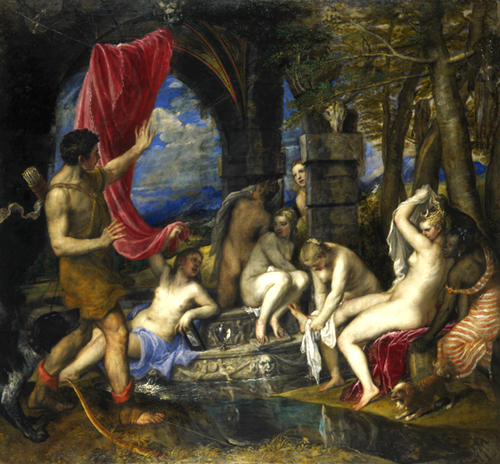 The central works are Titian’s two great so-called poesie, Diana and Actaeon and Diana and Callisto, painted for the king of Spain Philip II in the late 1550s, but the collection also includes masterworks by Raphael, Rembrandt, Poussin, Rubens and others. The deal with the museum is that if they can raise £50 million before the end of the year, the Duke will sell them the Diana and Actaeon and offer them the opportunity to buy its counterpart for a similar amount in four years’ time. Also, he will let the museum keep the rest of the collection in deposit for another 21 years. The National Gallery of Edinburgh has joined with the National Gallery of London in an effort to raise the money, and if they’re successful the paintings will rotate between the galleries in the future. I have no idea how this endeavour is working out for the museums, but can only say that losing the Titians to a private collector and therefore and uncertain fate in terms of their availability to the public would be a great loss. On the other hand, having them secured for the National Galleries would be wonderful. Surely the greatest Titians on private hands, these are amongst the Venetian’s supreme masterpieces, works in which his lifelong exploration of colour as metaphysical enunciator of the human experience culminate. 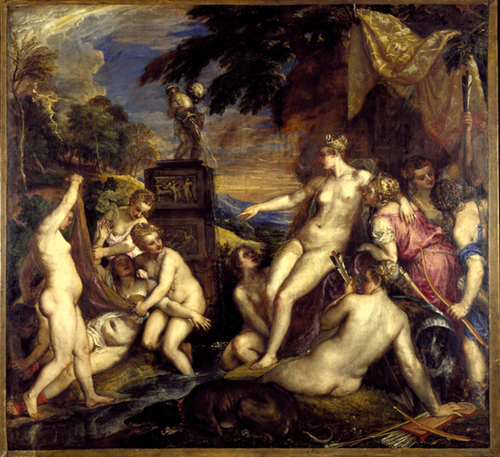 The rendering of texture and visible facture of these canvases gloriously carries the human drama enacted in the stories of the hunter Actaeon fatally stumbling upon the bathing Goddess of the hunt Diana en deshabillé, and the ruthless punishment of the nymph Callisto at the hands of the same goddess for unwillingly having been rendered pregnant by Jupiter. Dealing with the desire as a driving force of human existence, eternally unfolding beween death and new life. The beauty discovered by the innocent hunter is giving deadly edge by the withering gaze of his goddess. A sudden coming of age with no way back. The nymph, for her part, is ruthlessly driven from her state of bliss, to her death in the wilderness, upon the conception of new life within her. A fall from innocence into profane life. Titian’s mise-en-scène of these essential human narratives is entirely involved, lavishly sensual for Actaeon and a painfully, almost threateningly beautiful landscape dissolving in the evening sun for Callisto. … Right. So if there’s any justice, these pictures will remain on display in Edinburgh for many years to come, if not in perpetuity. Along with Raphael’s delightful and virtuosic Madonna and Child, Rembrandt’s searingly introspective Self-Portrait, Poussin’s almost abstractly perfect Sacraments and the other wonderful works in the Bridgewater Collection. If you wish to contribute to the purchase of the Diana and Actaeon, you can donate here.